I’m not sure how I had never previously come across Hugh Salmon, and I’m so very glad I did as his writing resonates with me on both personal and professional levels. I’ve never highlighted so much from one book on my Kindle! This is a book about – making sense. Sometimes the world is a complicated place and too often we struggle to make the right decisions and navigate ourselves effectively through our lives. 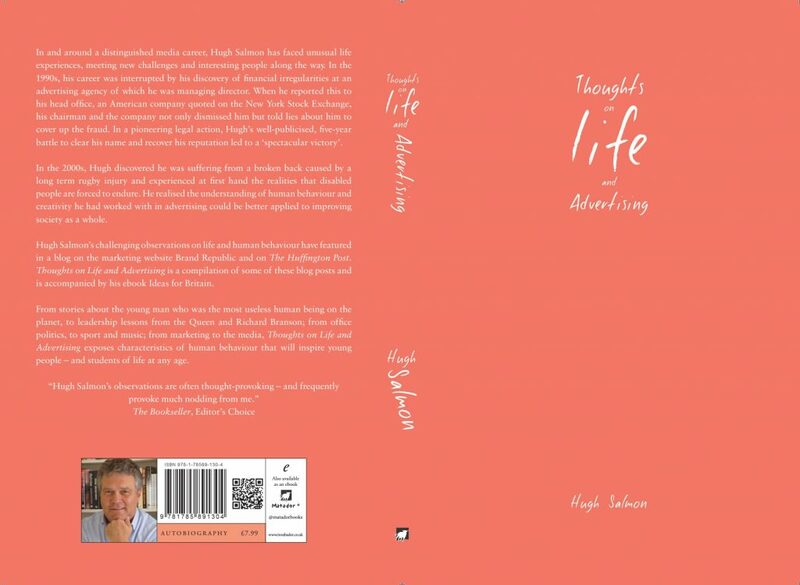 In Thoughts on Life and Advertising, Hugh Salmon provides a perspective and a new way of looking at a whole host of everyday issues, and causes us to re-think our prejudices and attitudes. His ideas are always challenging, never dull, often profound, and sometimes wrong. Nevertheless, I think everyone who reads this book will feel better for having read it, and will have enjoyed spending time in the company of a wise and fun companion. I loved this book by Hugh Salmon who … (had) … a distinguished career in advertising, despite a couple of unplanned interruptions including a 5-year long transatlantic law suit with his then employer, which he eventually won in spectacular fashion. Thereafter, having to cut short his career due to a broken back thought to have been caused at school playing rugby, but not discovered until years later. I found his book thought provoking; highly entertaining and truly inspirational! I would thoroughly recommend it to anyone who sees the importance of standing up for what they believe in and in doing the right thing. Hugh Salmon you are one top bloke!